A recurring complaint in Port Melbourne is that Station Pier is off limits to locals – even though that is only partly true. It is open except on cruise ship days – the number of which increase each season. But like a restaurant that is closed on the day you visit, the impression lingers. This is contrasted with memories of growing up in Port in the ’50s – a perpetual summer of fishing, swimming, diving and messing about on the piers. In those days, there could be eight ships berthed at the piers and most of them stayed awhile. 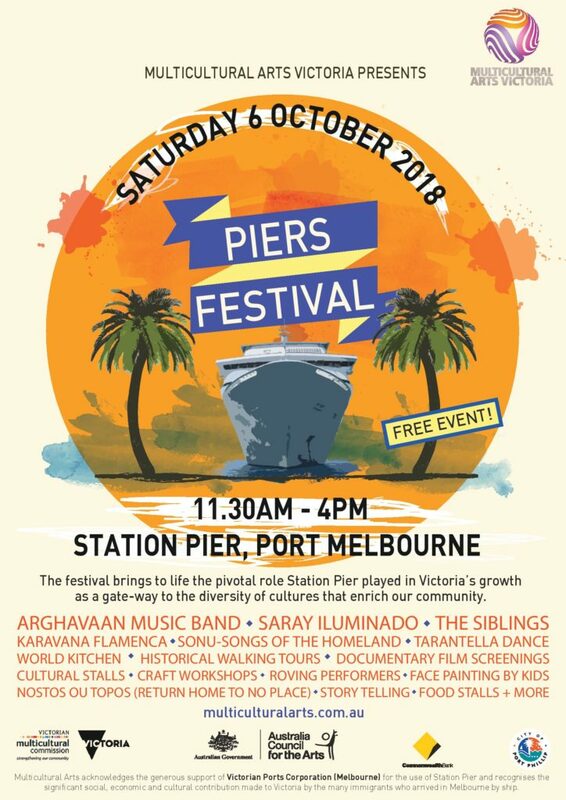 This weekend Station Pier welcomes visitors as it hosts that most apposite of festivals – Multicultural Arts Victoria’s Piers Festival. Station Pier and Princes Pier are, of course, the first place where thousands of post-war migrants began their lives in Australia. As such, the Piers are a potent repository of memory and association. The Piers Festival is a chance to wander the Pier freely and explore the farthest terminal building where most of the day’s activities will take place. More people arrive at Station Pier now in a single cruise ship than in all those eight ships combined. Their visit is brief. Here today, and gone today or tomorrow. Station Pier and Port’s modest icons, the beacon and the crane, are dwarfed by cruise ships. The heritage listed pier is compared unfavourably with other ports of call. The growth of cruise shipping at Station Pier is limited by the facilities and the constraints of its location. It is not able to accommodate the largest cruise ships such as Ovation of the Seas with its 6000 passengers and crew. Cruise shipping has grown hugely – from 16 ship visits in 2004/2005 with 4,839​ passengers and crew to 85 ship visits and 280,202 passengers and crew1 – a 823 percentage increase. When the Bayside site (now Beacon Cove) was earmarked for development in the late 1980s shipping had ceased. Cruise shipping was not on the radar. Rail access to Princes Pier was cut off and designed out of the development. The ferry to Tasmania was wooed from Webb Dock to make its home at Station Pier in response to a desire to keep some shipping in Port. 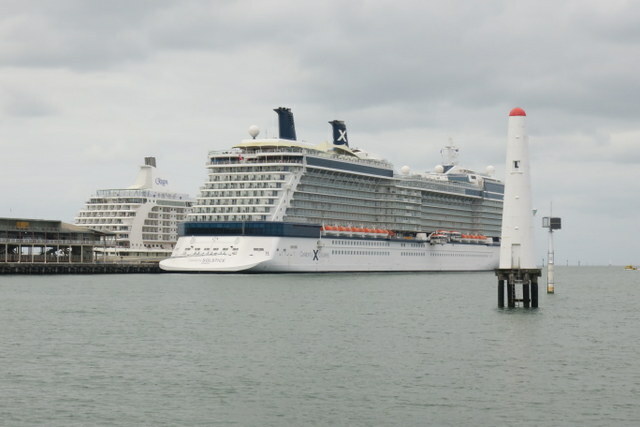 Now the conjunction of the Spirit of Tasmania and increasing cruise ship visits cause summer season headaches for locals. The City of Port Phillip has responded by introducing a separated queuing lane on Beach St for Waterfront Place. This season traffic controllers will be deployed during the morning peak on cruise ship days to keep traffic flowing through the Princes St/Waterfront Place roundabout. The government has recently made $5.8m available to the Victorian Ports Corporation to come up with a plan to improve the Station Pier experience for cruise ship visitors and locals. The permit call in of the contentious 1-11 Waterfront Place development is part of that. The Port does not want to cut off any options, said VicPorts CEO Rachel Johnson at a recent consultation. The first cruise ship of the season, the Sea Princess, arrived on Tuesday 2 October to be greeted by the volunteer Waterfront Welcomers. The warmth of the welcome and hospitality is perhaps remembered more fondly than the facilities. A bus, sponsored by Port Melbourne businesses, will be on hand for those who’d prefer a ride from the start of the Pier to the second terminal building. If you’ve got thoughts on how the Station Pier experience could be improved, complete the Victorian Ports Corporation survey.